A definitely Greek dessert! Rich and delicious. stir with a whisk. Lower the heat to medium low. mixture to temper and then add the egg yolk mixture to the pot. 3. Continue to cook over medium low heat until the cream starts to thicken, stirring continuously. 4. When the custard has thickened, remove from heat and stir in the vanilla extract and the butter. ✚  Preheat the oven to 350℉. one in the bottom of the pan, making sure to brush each one thoroughly with melted butter. in the pan and half out of the pan horizontally. 3. Add the custard in an even layer on top of the sheets, smoothing the surface with a spatula. the top layers and then use a serrated knife. 6. 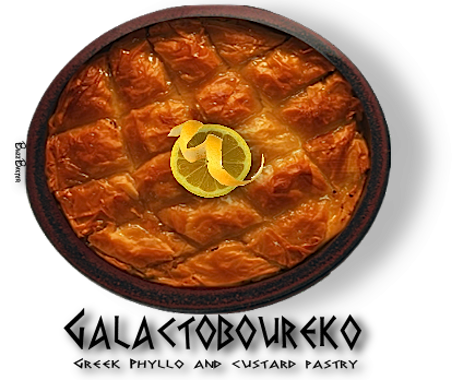 Bake in a preheated oven for 45 minutes or until the phyllo turns a deep golden color. in the lemon juice. Remove from heat and set aside to cool. and then carefully ladle the syrup over the galaktoboureko and allow time for it to be absorbed.